In this guest post Simon Dell calls for the media to stop trying to whip up outrage based on the back of a few social media posts. When Australian company Unicharm launched a new TVC for their Sofy BeFresh pads it apparently, raised the ire of a number of female viewers who took to Twitter to express their anger at the suggestion of fat shaming. Except, it didn’t really play out like that. Fairfax reporter Liam Mannix, jumped on those angry tweets and quickly whipped up an article highlighting the offence that the advert was causing to people and cited three particular tweets as evidence, offering just a single tweet to counter. He then handed the stage over to advertising writer Jane Caro (renowned feminist and atheist) who got seven paragraphs to launch into how sexist Unicharm were being. (Incidentally, Unicharm got two paragraphs by the way of a defence). Taken at face value, you would assume that there was significant groundswell of public opinion that this advert was disgusting and offensive and sooner or later our residents of Canberra, a sub-editor of Mamma Mia or Waleed Aly would be wading in to tear a new hole into the CEO of Unicharm. Or that whatever TV channels had been playing the advert, would quickly remove it with grovelling apologies. And that finally, the Ad Standards Board would come sweeping in to uphold all the complaints. The article was shared on the Brisbane Time’s Facebook page where, one would have expected given the accusatory tone of Mannix’s article (and his own defence when questioned on Twitter), his stance would have found backing. But it didn’t. Far from it. The dissenting angry voices were almost impossible to find with a huge majority of women liking it, commenting on it that the advert felt oh-so-familiar and in fact, sharing it around. Even a few brave men piped up. 24-hours after the post appeared, there had been 150 likes, 29 shares and 133 comment threads – in fact and you would have been hard pressed to find a negative sentiment amongst the comments. Even Rose Flanagan, the actress who portrayed ‘Period Self’ defended the ad. Further to the ‘drama’ around Unicharm’s ad, Apple’s new product launch the following morning featured some extremely powerful image-altering Adobe software that was demonstrated on stage by showing how they change the visual of a woman not smiling, to a woman smiling. That of course riled up someone somewhere, with an actual suggestion that Apple should ‘stop telling women to smile’. Others simply saw it for what it was: a demonstration of the power of some software, and not a subverted attempt to control the minds of the women of America. Which leads me to the point of this article: an opinion on Twitter isn’t news. Nor is it the opinion of everyone else. It’s the equivalent of running out in the street, shoving a microphone under someone’s nose and asking them what they think of the crisis in Syria, recording that and then playing that back on the 5pm news as expert testimony. Proper public feedback requires hundreds of people in order to negate the variance; not three tweets from one evening. Media outlets need to stop relying on hysterical reactions from vocal commentators on Twitter in order to conjure up a news story – and that’s on both sides of the political spectrum. It would seem the Ad Standards Board felt the same, dismissing the complaints against the Sofy advert. For those Newsroom fans out there, there’s a quote in the first episode of the first series that sums up the push back we should be demonstrating how these articles presented to us, with executive producer Mackenzie MacHale, played by Emily Mortimer appealing for a return to ‘proper’ journalism. That may be wishful thinking and it may be an extreme we don’t really want to see, but please, at least let’s stop using Twitter as the basis for our news stories. Unless you’ve conducted your own wide-ranging research, I don’t really see how you can claim that “actually no one was fussed by these issues”. Your “research” is based on your own opinion, not facts. And it’s pretty odd that you’re dismissing Twitter as hysterical but then using Facebook comments to support your argument. He was saying both twitter and facebook’s results showed no one was talking about it on social media. He wasn’t using facebook to dismiss his fact about twitter, just support the point that the hysteria was only hysteria because some journalist said it was. The journalist used three tweets to suggest there was wide-spread hysteria about the advert in order to produce an article. Facebook – where a balance of opinion was available to be published – showed that 99% of the population actually found the advert funny; in stark contrast to the journalist’s piece. I can hear all the news outlets saying, hey that’s great idea for a story… quick, what’s twitter bitching about now? This article is spot on. But the worst thing about quoting from twitter is the way that most twitter comments come from people using pseudonyms. Not only does the reader not know who made a comment but in many cases even the reporter is ignorant! The commentator could easily have an undisclosed vested interest in pushing that line. In other cases, the twitter comment comes from another journalist using a pseudonym. It’s not a news flash that journalists are creating mountains out of molehills. I think you will find that this occurs even without the assistance of social media. Journalists will often contact corporate media relations professionals and seek a response to an “emerging” community story regarding a particular topic. It doesn’t take much scratching to work out that all that is beneath the surface is an individual or, perhaps, a small group of disgruntled people with a particular view. Their view is valid, but journalists are so time-poor that story ideas become “the story”. The story is that three people are unhappy about something rather than an investigation into whether those concerns are valid and/or widely-held. News tips email addresses and Twitter accounts have just replaced the pub for new journalists seeking to find a story that will rate. Great read & spot on. You’re right, an opinion on Twitter is not news by itself. That does not mean it is not a valuable part of a story. As journalists we do try to get some sense of the public’s opinion about things. You can do surveys, which are more empirical, or you can hop on Twitter and see what people are talking about. It’s no different to a journalist wandering down to the local pub and chatting to the regulars – it’s what we’re expected to do. Actually, journalists have been doing just this since the dawn of newspapers. It’s called a vox pop – which comes from the Latin vox populi, or voice of the people. Newspapers play a role in enabling public debate and in letting people speak about issues that matter to them. If we don’t do that, and we only allow people to speak through survey results, it tends to quieten down public debate a bit. We don’t call them experts. We call them people – and they are entitled to have an opinion. When it’s clear, as I believe it was in this case, that a lot of people were getting fired up about something on either side, then it might be news. There are other things that make this news. One – Jane Caro, who is an expert (and an “atheist”, as you charmingly title her) slammed the advert as sexist and nasty. Two – the company apologised. Di Stef is right. 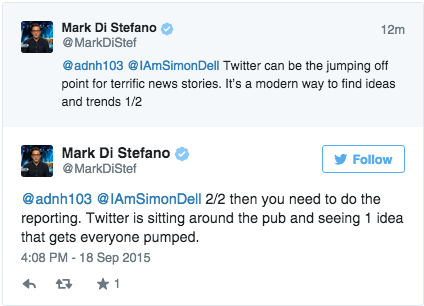 Twitter is a good jumping off point for a story – it tells us as journalists what people are talking about. It’s not enough to just report that though; that’s why we go and gather facts and expert opinion and build a story ?around? it. Disagree with what people on Twitter are saying? Take to Facebook and complain about it. That’s how the public sphere is supposed to work. Three points back to you. 1. Your ENTIRE story was three Twitter quotes and back-up from Jane Caro. That’s not news. That’s not even close to news. That’s column inches fuelled by a tiny minority opinion. 2. And good to see you did your research on Jane Caro – she actually labels HERSELF as those three things – author, feminist, atheist – on her Twitter profile. But of course, you didn’t read that either, did you? 3. I know what a Vox pop is. But a Vox pop is by definition, random. You didn’t randomise the opinions you cut and paste into your article. You took the ones you wanted to take in order to generate hysteria. If you had taken a genuine segment of the public, you wouldn’t have found any hysteria and you wouldn’t have had an article to write. You’re quite right Simon. The other point is that no one really gives a f@@@ about what a few Twitter (l)users think anyway.